Exceptional Akan language iPhone and iPad apps. A comprehensive course to help you speak Asante Twi. The best course for learning Asante Twi grammar and vocabulary. The premier Twi phrase book with more than 3000 phrase entries. A simple keyboard for typing better Twi, Fante, Ewe and Ga. 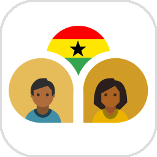 The most-engaging and fun way for kids to learn basic Asante Twi.